Fill-Rite Piston Pumps have an aluminum body with a stainless steel liner. Providing smooth, continuous transfer of medium viscosity liquids, as well as oil, gasoline and diesel fuel. Pump easily mounts to a standard drum with 2 inch NPT-F threaded tank adapter. 76 Liters per 100 Strokes. 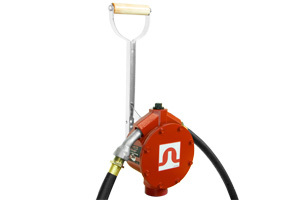 Piston Hand Pump with Steel Telescoping Tube and Nozzle Spout. Made in the U.S.A.
Adaptable for drums, kegs, and storage tanks. Anti-siphoning valve. Check valve and strainer. Goose neck spout and pail hook. Pump can be set up for reverse flow. Pump may be padlocked. Steel handle and wood grip.